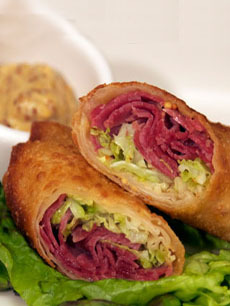 We love this fusion recipe for St. Patrick’s Day: Corned Beef and Cabbage Egg Rolls. It’s from Dietz and Watson, purveyors of fine deli meats. Chinese egg rolls are filled with cabbage and bits of pork. Here, corned beef substitutes for the pork, creating an “Irish” egg roll. The recipe serves 4. Substituting lots of corned beef for bits of pork makes this an “Irish” egg roll. Photo courtesy Dietz & Watson. 1. COOK CABBAGE. Melt butter in a large skillet over high heat. Add cabbage and cook just until the cabbage starts to give off liquid and reduces in half. Do not overcook; the cabbage should remain crisp. Season with salt and pepper to taste. Refrigerate cabbage until completely cool, at least two hours. 2. MAKE EGG ROLLS. On a work surface, create double wrappers by layering one egg roll wrapper on top of another, flat. Spread each of the four doubled wrappers evenly with 1 teaspoon of sandwich spread. Pat cabbage dry with a paper towel. Distribute the cabbage on the wrappers and top with the corned beef. Heavily brush the edges of one egg roll wrapper with the beaten egg. Begin rolling the wrapper tightly around the filling. Halfway up, fold in the sides, then continue to roll the rest of the way. Repeat with the other wrappers. 3. FRY EGG ROLLS. In a large, high-sided pot, heat the oil to 350°F. Gently drop in the egg rolls and fry until golden brown and cooked through, about 5 minutes. Remove and drain on a towel. Slice in half on the bias. 4. SERVE. Serve with stone ground mustard or Chinese mustard for dipping.